The Flash shifts focus back to the Cicada plot as the team try to figure out a way to protect the Metahumans he’s targetting. I mentioned in my review of the pre-crossover midseason finale that it felt like there wasn’t a lot of story left to the Cicada plot and that it should start wrapping up soon. Episodes like this basically prove that point as there’s clearly nothing new that can be explored about this character. His inclusion basically amounts to going after every Metahuman he can find so that he can kill them, Team Flash intervening and some variation of him getting away after either successfully killing his target or not quite managing. It’s a formula that gets old very quickly and robs Cicada of his menace. It also doesn’t help that Chris Klein has lost a lot of the nuance to his performance and is playing him as cartoonishly evil at this point which makes it difficult to take him seriously. 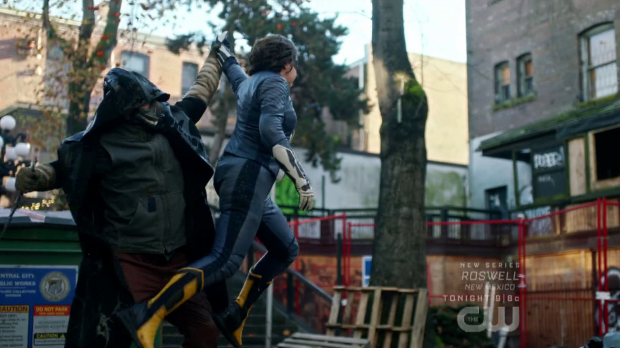 One good thing is that this episode has Team Flash trying to be proactive in dealing with this situation. They realise that Cicada is working off a chronological list taking from the CCPD database so they hatch a plan to put every Metahuman on that list into a witness protection plan. There’s a very brief mention of the fact that Metahumans are people too and the ones on the list have served their time so don’t deserve to be hunted because they happen to be Metahumans. There’s the sense of a larger issue that the writers are driving at but never quite get to though it’s possible that the cure plot will allow for more exploration of this. An effective microcosm of lives being complicated by being a Metahuman comes from Norvock who get a small but very brief arc. He talks about the day of the particle accelerator explosion and how he came to have a snake in his eye. The key point to latch onto about his origin story is that he gained his powers by accident when he was trying to save a kid. It’s an action he regrets because he hates having his powers and the experience has motivated him to only look out for himself. This is resolved when he gives up his place in line in order to help other Metahumans get on the helicopter before thinking about saving himself. He is almost killed as a result but Ralph saves him at the last second. It doesn’t take up much time in the episode but it’s a nicely handled arc that adds some depth to Norvock while also making him the face of Cicada’s Metahuman victims to enhance the point that they don’t deserve this. It’s Nora’s turn to be put out of commission this week after Barry last week though the circumstances are very different. Nora is left paralysed by Cicada’s attack which should be a big deal but isn’t as Nora’s rapid healing will eventually kick in and restore her fully. This doesn’t stop a morbid atmosphere being created in the aftermath of her injury even though her recovery is only a matter of time. 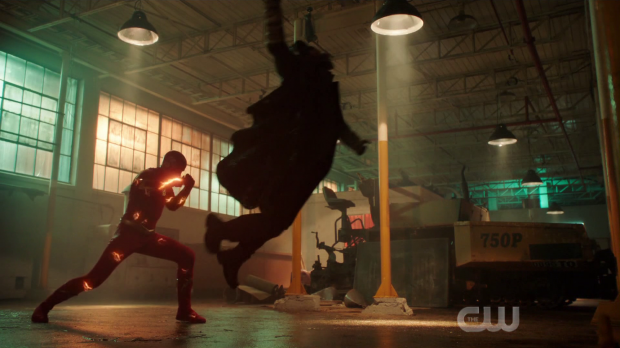 This is supposed to set up Barry being consumed by rage which doesn’t really kick in until the very end of the episode when he loses control and almost kills Cicada. It lacks impact because up until this point he was actually dealing with his feelings really well. He was focused on the plan and trying not to think about Nora. If there had been some sort of buildup to needing Nora to pull him back then it might have been more effective but the sloppy execution made it feel painfully forced. 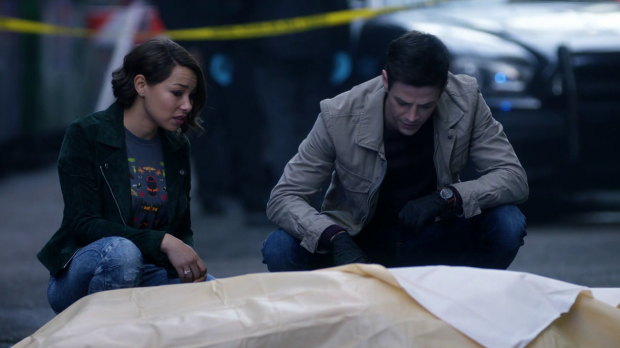 The real purpose of this is for Barry to understand what Cicada’s going through with Grace in the hospital. Cecille even says that she senses the same anger in Barry that she has sensed from Cicada. Drawing that parallel allows Barry to come up with the idea of appealing to Cicada’s heart by saving Grace. He thinks that the key to defeating him could be helping his daughter. It’s a strange moment as Barry shouldn’t need to be consumed by murderous rage in order to understand that Cicada cares about his daughter. This is something that should have occurred to him before which makes this plot feel even more forced. On the fringes of this story is the work being done on a Metahuman cure. Killer Frost is actively sabotaging Caitlin’s efforts to work on one because she’s afraid of what it could mean for her. By the end of the episode the two entities find themselves back on the same page when Caitlin makes it clear that she would never take the cure and each of them reaffirm their promise to protect each other. As much as I don’t like the Caitlin/Killer Frost setup I did find this entertaining and Danielle Panabaker continues to do a great job as Killer Frost. The debate over the cure isn’t explored in great detail but there are hints of some of the major ideas that could be explored. Ralph makes for a reasonable mouthpiece for this issue as he is a Metahuman happy with his powers so his perspective is certainly relevant. He sees the cure as a good thing because not everyone will see having abilities as a good thing, particularly if they are being hunted by deranged serial killers. He points out that a cure would save their lives in this case. Ralph basically comes from a pro-choice perspective in terms of Metahuman powers where Killer Frost sees it as an issue of survival because curing Caitlin would mean the death of her. Caitlin taking the cure isn’t a concern for her but having it fall into the wrong hands certainly is. There is a whole debate to be had on what the right hands are and if there are circumstances where people should have the cure forced on them. Considering the complexity of this issue I wish the show was spending more time on it rather than the half baked mentions we have so far. The Metahuman witness protection idea is a strong one with questionable execution. It made for a refreshing change to see Team Flash protecting Metahumans rather than fighting them but outside of the brief arc for znorvock they amount to little more than a group of people huddling scared waiting for others to act. It’s also another example of the writers ignoring resources Team Flash has in order to manufacture tension. Barry gives Shawna aka. Peek-a-Boo the breach device to get her to safety which immediately begs the question why a helicopter was needed to evacuate them when a breach could do easily be opened. It looks like this selective memory to create dangerous situations will never go away on this show which really is a pity. The most interesting plot is something the show isn’t really focusing on. Sherloque’s investigation of Nora is gaining some traction in that he’s taking note of things that don’t add up about her. He has only managed to translate one sentence of her journal so far and it’s far from conclusive as it only says that the timeline is malleable which could mean a great many things. Analysis of the handwriting reveals that there are two distinct styles so Sherloque now knows that Nora is lying about something. The moment he wonders to himself who it could be with his own face reflected in the computer screen was a really effective way of showing that the answer was staring him in the face. 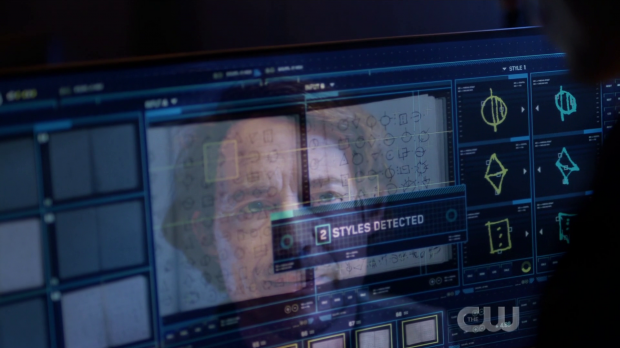 Sherloque’s discussion with Iris when she notices what he’s doing is a clear indication of why he’s best placed to find out the truth as Iris is blinded by Nora being her daughter so doesn’t pay attention to the signs. She warns him to abandon this investigation and hilariously likens it to all the times she abandoned stories that didn’t pan out for her in the past. In theory it’s reasonable but the lack of focus on Iris’ journalistic exploits makes the statement an empty one. It was definitely a good scene though with a strong performance from Candice Patton. The scenes she shares with Nora are really strong as well showing increased comfort on both sides. A mediocre episode that sets up interesting things but fails to follow through on them. Nora’s paralysis is a him fisted setup for Barry to eventually be consumed by the same rage that motivates Cicada. It only comes into play in a big way at the end of the episode and is easily resolved. Barry does come up with the idea of saving Grace as the key to defeating Cicada but this is something that should have occurred to him before now and it certainly didn’t need him to experience murderous rage for this idea to present itself. The Metahuman cure plot has the potential to be interesting but never quite gets to that point as the nuances of the debate are never explored. Ralph’s position on the viability of a cure is an interesting one and exploring the idea of those with powers having their lives ruined by them definitely could be interesting but the writers don’t let the plot focus on these ideas. The Caitlin and Killer Frost dynamic is similarly half baked though Danielle Panabaker is good in the role. Sherloque investigating Nora works really well because of his growing suspicions and the fact that Iris is too blinded by the familial connection to consider things objectively. Sadly the show feels like its spinning its wheels at the moment as nothing is progressing all that strongly.